Everyone knows that a dog is man’s best friend. Of course, once the kids heard about that fact, they started making the relatively reasonable conclusion that a dog is kid’s best friend, too. Still, that’s a somewhat fair conclusion, but not all households are so easily prepared for a canine buddy to run around. Between rented apartments, fur-devouring carpets, or those nasty allergies, sometimes it is tough to bring a dog home. And, even if you can, it doesn’t take too long for those kiddos to realize that one best friend isn’t nearly as good as all the best friends. When you think of it that way, it isn’t so hard to imagine a possible reality where 101 Dalmatians might actually occur. Well, your kids have always said that they wanted a dog and maybe it is about time that you give into those desires. But… it might be a good idea to a bit of a test run. Perhaps with a dog who is already potty trained and is less likely to shred all of your favorite shoes. 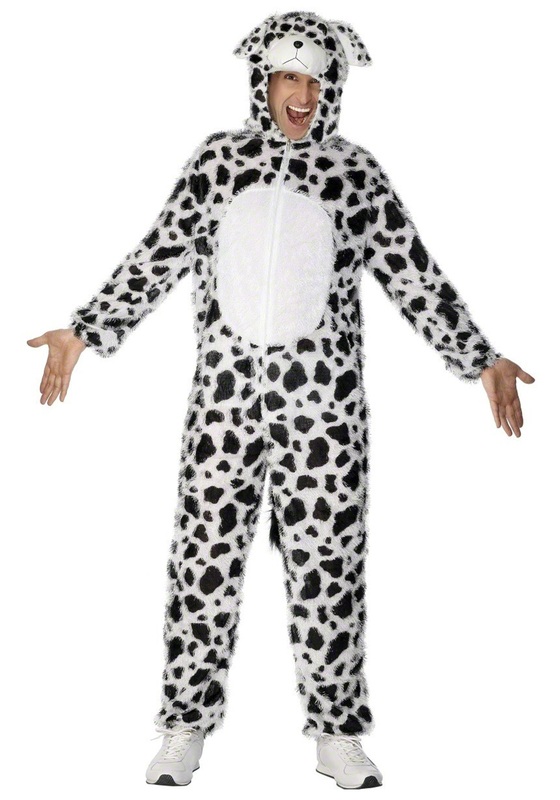 We’ve got the perfect solution with this Adult Spot Dalmatian costume. This black and white spotted jumpsuit is sure to transform you into the most adorable best buddy that anyone has ever seen—kid or otherwise. The attached hood pulls up to transform your head into the shape of a dog’s face and the bright white belly just demands some loving pets. Heck, you might enjoy all the attention so much that it’ll be tough to transform back. If this works well, you can pick up a few other sizes and start building up the cast of your own movie.